I’m sharing an quick and easy dessert today that can be a perfect addition to any party, from a cocktail party to a kid’s birthday party! 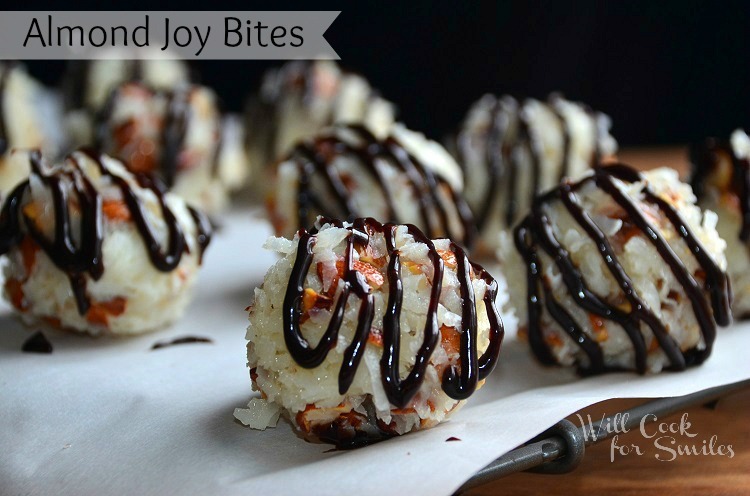 I’m sharing Almond Joy Bites, clusters of coconut goodness mixed with toasted almonds and drizzled in chocolate! Honestly, this was not on the editorial calendar for today. I was going to share something completely different but after making these bites yesterday, I had to move everything over and squeeze them in! 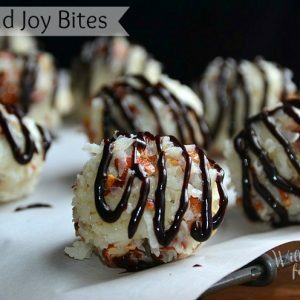 These Almond Joy Bites are so easy to make and they are absolutely addicting. I see them being a huge success at a party with kids and adults alike. 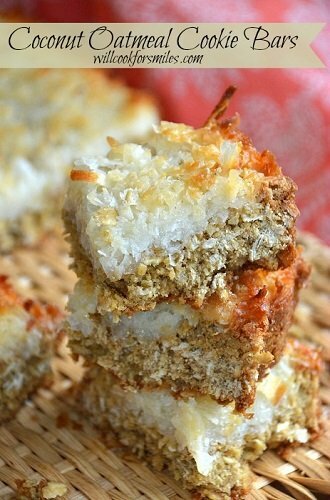 I do want to mention one change that I would make the next time I will be making these bites. Next time, I would chop the coconut before mixing them with condensed milk and almonds. It will stick a little better and be less stringy. 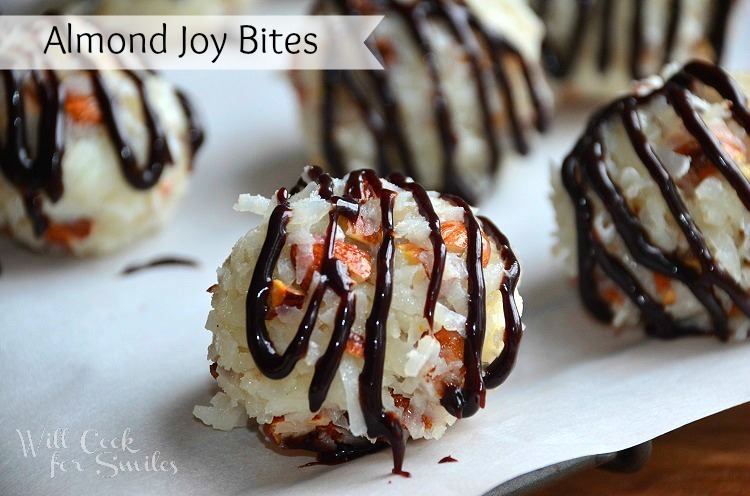 Almond Joy Bites, clusters of coconut goodness mixed with toasted almonds and drizzled in chocolate. 1/2 cup of semi-sweet chocolate chips I used Nestlé Toll House, yum! If toasting the almonds yourself: Preheat the over to 400. Spread raw almonds over a baking sheet. Bake for about 4 minutes. Let them cool a little and chop them up. Chop the coconut flakes and add them to a mixing bowl. Add the toasted, chopped almonds and mix until combined. Form balls with the coconut mixture, pressing them together, hard. Lay the candy bites on the parchment paper (waxy side up) and chill them for about an hour. Melt the chocolate chips and butter in the microwave at half power for about a minute, stirring every 20 seconds. 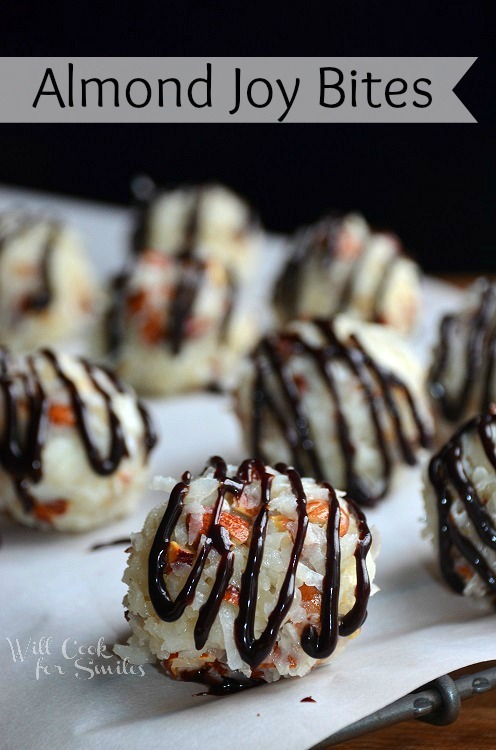 Drizzle chilled Almond Joy Bites with chocolate. I recommend keeping the candy in the fridge (and covered of course, so they don't dry out) until ready to serve. They taste great and stay together better after being chilled. PLEASE NOTE: I switched the email delivery system! The switch happened in the middle of March. If you subscribed before then, PLEASE re-subscribe to the email in the side bar! HUGS! Oh. My. Word! 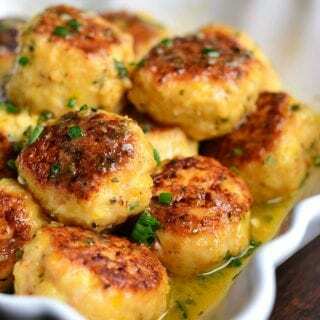 These little balls of Heaven need to be made asap! I love Almond Joy. Totally my fave candy. I’d love for you to come share this at our Pinteresting Party! OMG Lyuba. I’m in love! I just died and went to heaven, seriously. These bites look delicious!! 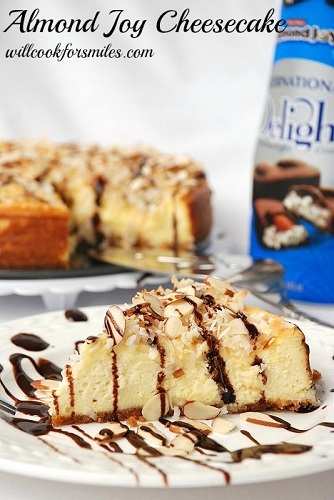 I love almond joys so I can’t wait to try this recipe. Thank you for sharing. I’m your newest follower through bloglovin. I’d love for you to visit my blog @ gloriouslymade.blogspot.com. Thank you for the sweet comment, Lea! Today I am checking out your yummy link from the Made by you Monday party!! So glad I did! Almond has to be one of the absolute best flavors ever. These look amazing. 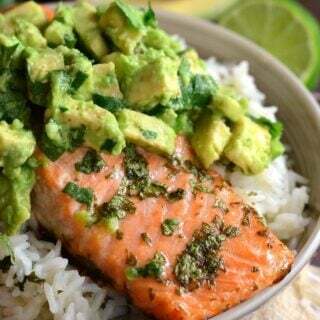 Um YUM! I love almond joys and these looks absolutely sinful! Thanks for sharing. YUM! I LOVE Almond Joys, and homemade is always better. Can’t wait to try them out. Thanks so much for sharing. Have a wonderful day! These look super delish! Yum! I love almond joys! These sound soooo good! Yummy! Oh yum, I love Almond Joys and these look SO good!! Can’t wait to try them out. These little bites might be dangerous in my hands, but I’m willing to take the risk! Thank you for a sweet comment, Krista! 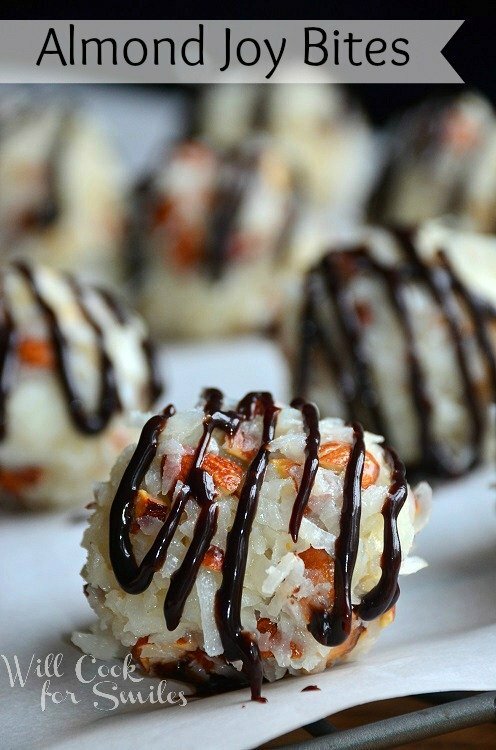 Coconut goodness…please hand those over!!! Those are incredible looking!!! I wish I could! They need to invent that 🙂 Thank you! Wow! 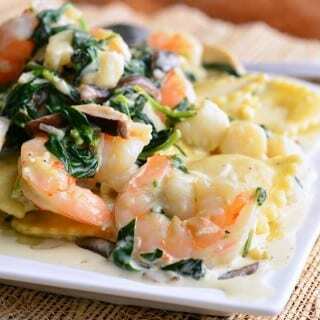 Not only do these look incredibly delicious, they seem like they would be easy too! Must. make. soon. YUMMY, Lyuba! These look fantastic. Gorgeous! What a great Mother’s Day treat! Oh my gosh! Love this idea!!!! These look heavenly. I can tell how tasty these are from the recipe but also the presentation: they are beautiful. Thanks for sharing them with us on foodie friday. These look so yummy! 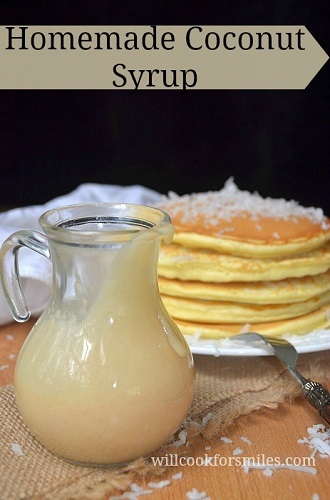 I’m definitely going to give them a try as soon as I can pick up some sweetened condensed milk or find a recipe to make it from our raw milk. One thing an older friend taught me about cooking with coconut that has made a HUGE improvement in my coconut recipes is soaking the coconut in milk or coconut milk for 15-30 minutes before cooking with it. The coconut rehydrates and becomes very tender! Thank you for that tip, Lindsay! I will definitely try it. I usually cook with fresh opened coconut for this reason, it’s more soft. I will have to soak it first! This looks delicious! I’ve pinned it, printed the recipe, and now to find the time to make it. It’s on the list, for sure, for a weekend treat!! I sure hope that your liked it, Kim! Thank you! Wow these look amazing! 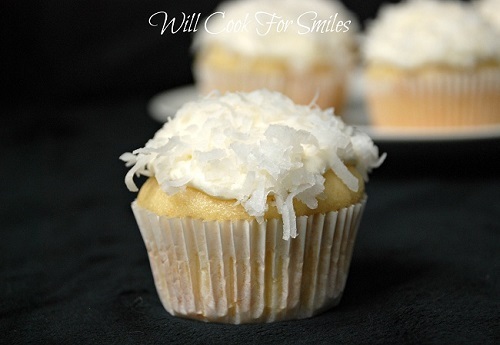 I’m featuring this tonight at my link party and pinning! Been looking for sweet treats that don’t involve flour. Looks like I found a doozy! Woah. These look absolutely scrumptious, and I’m not just saying that because I’m hungry right now. Pinning this so I can try it out soon! Thanks for sharing. I can’t wait to make these for my son’s graduation party—could you please tell me about how many Bites the recipe yields? Hope everyone enjoys them as much as we did!! Is there really only 1/4 T butter melted with chocolate chips or is this a typo? Yes, a quarter tablespoon since it’s only 1/2 cup of chocolate chips. You really don’t need the butter, but I find that adding a little bit gives it extra gloss. Thanks so much. Will be making these little temptations this afternoon! Almond Joy’s are one of my all-time fave candies! I have to try these, yum! 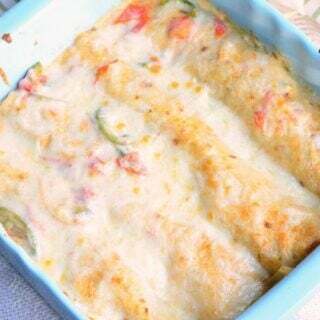 Thanks for sharing the recipe, Lyuba! Oh my goodness come to mama. I ADORE Almond Joys! Almond Joy is my favorite candy! These look fantastic!! 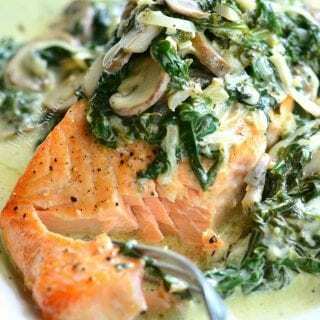 I love recipes that are so tasty you have to share them right away! These sound delicious! In keeping with the Almond Joy theme……I dipped my bites into the dark chocolate completely. A little scribble on top just wasn’t enough chocolate for me! 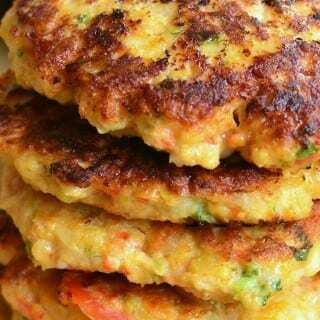 Let them sit on a waxed cookie sheet in the fridge to harden up for about one hour and they tasted even better! Thanks for such a good recipe. Definitely a keeper!